Wallpapering on a flat surface is one thing. Taking the wallpaper around the corner is another. So, to make sure you get a neat finish around internal corners when you’re wallpapering, read these handy instructions. It's important not to finish a length of wallpaper in a corner, as any imperfections in the corner will become apparent. Likewise, running a large strip of wallpaper around a corner means it's hard to avoid creases. 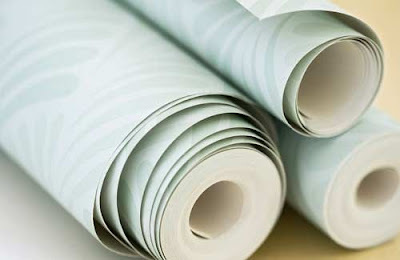 To avoid these problems you should plan to run a small amount of wallpaper around the corner onto the next wall. Measure from the edge of the last piece of wallpaper you have hung to the corner. Measure at the top, middle and bottom, and take the largest of these measurements and add 12mm. Make sure you match patterns as closely as possible for patterned wallpaper designs. Cut your next strip of wallpaper to this measurement, and keep the offcut. Hang the cut strip of wallpaper, butting it up to the previous strip. Make sure you smooth it around the corner, as well as on both walls, and trim as usual. Hang a plumb line on the new wall at the distance of the width of the offcut of paper from the corner, and mark the vertical with the pencil. Use the marks to hang the offcut vertically. Hang this so it reaches the corner. It will overlap the wallpaper that went around the corner, producing a neat finish.